Scene from Sinulog Festival 2012. Photo by Constantine Agustin. The Sinulog Festival is held annually every third Sunday of January. It is the feast day of the Infant Jesus, known locally as the Señor Santo Niño. Global Voices community members who arrive in Cebu a few days ahead of the Global Voices Citizen Media Summit can join the Sinulog mardi gras on January 18. A dance ritual honoring the image of the Santo Niño, Sinulog imitates the water current or “sulog” of the Pahina River of Cebu City in a two-step forward/one-step backward movement to the beat of drums. Candle vendors perform this dance in front of the Basilica de Santo Niño as a form of supplication or thanksgiving to the Infant Jesus. 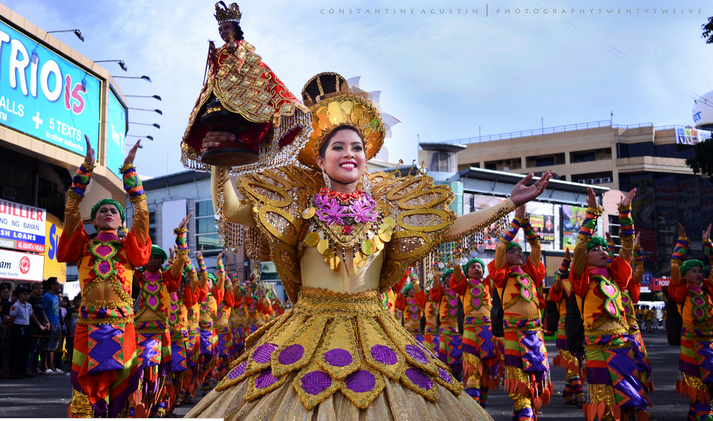 The first Sinulog was said to have been danced when Portuguese explorer Ferdinand Magellan arrived in Cebu, claimed the territory for the Spanish Crown, and initiated the conversion of the natives to Christianity around 500 years ago on April 7, 1521. As part of the baptismal ritual, Magellan offered the image of the Santo Niño to Queen Juana, wife of Cebu ruler Rajah Humabon. In response, Queen Juana is said to have danced with joy after receiving the image from Magellan. Sinulog in its present form began to take shape only in the year 1980, with a small parade around the Basilica de Santo Niño organized by what was then known as the Ministry of Sports and Youth Development. By the next year, in 1981, it was institutionalized into a festival with the creation of a Sinulog Committee tasked with organizing the festival. It has now evolved into a grand competition featuring different dance categories and contingents from various parts of the country. Like many such religious festivals that have become commercial events, the religious facets often take a back seat to the grand parade, rhythmic dance beats, colorful costumes and floats, the streets lined with food stalls, commercial gimmicks and all-night parties. But behind Sinulog’s present form as a glitzy tourist attraction, is the story of Cebu Island’s conversion to Christianity more than five centuries ago. They Don't Speak Spanish in the Philippines?